Its leaves are flat, oval, ribbed and short-stemmed, which may be up to 4″ wide and 6″ long. It can send up a leafless flower stock during the summer or autumn, and the stalk may be up to 10″ inches tall. Plantain has been used for thousands of years in various treatments, due to its potent medicinal properties. It contains high amounts of ascorbic acid, vitamin K, calcium and beta carotene. This plant has powerful anti-inflammatory, demulcent, antimicrobial, expectorant, astringent, anti-histamine, diuretic and styptic properties. The plantain leaves can be eaten raw or added to salads. Their anti-inflammatory properties soothe pain and itching due to skin issues, poison ivy rashes, boils, insect bites, and minor sores. You can also use them to prepare a syrup, tinctures, or tea. 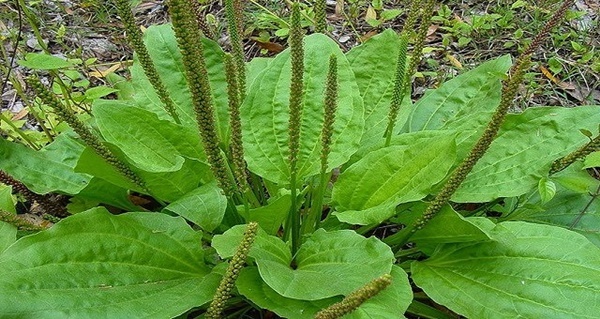 The leaves, as well as the plantain seeds, have laxative, demulcent, refrigerant, antidote, antiseptic, antibacterial, astringent, anti-inflammatory, diuretic, cardiac, antitussive, hemostatic, expectorant, vermifuge, poultice, and ophthalmic activity. This amazing plant has a wide range of medicinal uses. Life Advancer claims that “Plantain is like a panacea for our body and it can treat everything, from digestive problems to all menstrual difficulties, to almost all skin problems and even arthritis”. According to the American Materia Medica, Therapeutics and Pharmacognosy by Dr. Finley Ellingwood, MD, in 1919, it is incredibly effective in the case of all blood diseases female disorders, injuries, diarrheal conditions, rashes and bites on the skin, different glandular diseases, and mercury poisoning. Two Bulgarian clinical trials have shown that this plant effectively treats chronic bronchitis. Namely, the demulcent properties of plantain are similar to the ones of glycerin and pectin, which are common in cough syrups and throat drops. Demulcents soothe minor irritations and discomfort by forming a soothing film over the affected mucous membrane. The leaves of this miraculous plant are also high in vitamin C which effectively boosts the immune system. Moreover, they are a rich source of vitamin A which supports eye health and protects against macular degeneration, which can lead to blindness. This versatile wild vegetable can be used to maintain your overall health. It can be added to your salads, stir fries, and various other recipes. You can also chew it to quench thirst. You should add the whole Plantain plant, the seeds, roots, and leaves, to the boiling water. It should be left to steep for 10 min, and then, strain it. If you prefer your tea sweet, add a teaspoon of Manuka honey. Drink it and enjoy its numerous health benefits! Plant This and Say Goodbye to Spiders, Mice and Other Unwanted Pests in Your Home. Really.